So why should it matter to inbound marketers? Inbound marketing is great, especially when all your investment in creating engaging content pays off. And yet, it has some serious limitations. I’ve run inbound marketing programs for startups and for large organizations. Let me state this upfront: Inbound marketing only lets you see what your prospects want you to see. That’s bad news for you as a seller. To make it worse, your targets are completing 60% of their buying journey even before they reach out to vendors. Are you engaging them at the right time? 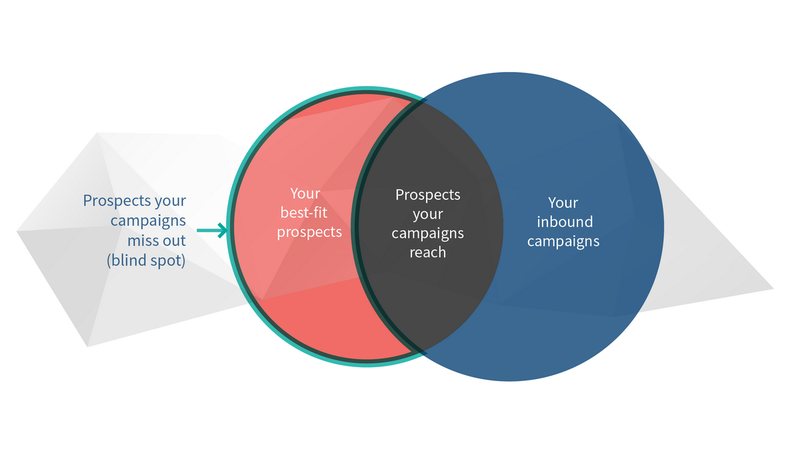 The Venn diagram above illustrates the fallacy of inbound. The circle on the left is your entire target audience. The one on your right is your inbound campaigns. Your campaigns are broadcast far and wide, but they don’t reach all the addressable prospects. This is the blind spot of your inbound marketing. Your blind spot includes all those folks who have never visited your slick website, never attended your spectacular event, or have never engaged with your high-quality content. As a marketer you have to wonder – how can they be so ignorant? It hurts, but there are valid reasons. So how do you get these prospects into your visible zone? Diversify your inbound programs – publish your content wherever your audience hangs out. Setup campaigns on as many channels as you see relevant for your targets. Don’t hold back – go all out to get your message across! Complement inbound campaigns with smart outbound efforts – no, outbound is NOT dead. And don’t believe those who say it is. It can work wonders for driving exponential growth when all inbound can manage is linear progress. But don’t spam – be smart, target wisely, know your prospects, and most importantly don’t lose hope. Keep iterating and improve with every cycle. Don’t be afraid to experiment with outreach hacks – technology is a great enabler, but it can also limit your perspective. Don’t get boxed in by what tactics work for others. Try social selling on LinkedIn, give pay-per-click hacks a shot, get smart referrals – run small experiments and apply the successful practices on large scale. Reach your prospects earlier – just waiting for them to engage with you will drop your odds and make the sale a bigger challenge. Let inbound marketing do its magic over time but don’t hold back from discovering target prospects earlier. That’s the only way to break the status quo, take down your competition and score new wins. Let technology do the hard work – it’s easy to talk about data, much more difficult to derive actionable insights for driving business results. Leverage teams and experts who derive smart insights from data and focus on what you do best. Not everyone can or needs to become a data scientist. Bottom line – inbound marketing does work wonders. But don’t rely on it to drive exponential growth, deliver instant results, or reach your entire target audience all at once. Inbound marketing is not the beginning and end of all marketing - don’t be afraid to look beyond it. For building a leak-proof marketing structure, you need to complement inbound with a set of diverse tactics that take advantage of every technology we have at our disposal today. It’s a long, winding road for marketers – blind spots make it even tougher to find your way.